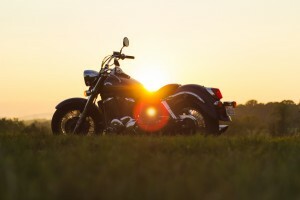 The summer sun and heat can hurt your motorcycle. Prevent any damage from occurring by learning how what you can do about it. The heat affects you in many ways. You get sunburned, freckles, dehydrated, and you can even get a heatstroke. You’re not the only victim of the heat. Your motorcycle can be affected by the sunny weather too. It won’t get freckly like you, but its paint job can fade. Maybe it won’t get a heatstroke, but it can get the motorcycle version of it: an overheated engine. Amsoil4liny has already covered what you can do to protect yourself when riding your bike under the sun, but this time, we will talk all about how the heat affects your bike and what you can do to prevent damage. By now you probably already know that parking your car under the shade protects the paint job. The same goes for your bike. Your motorcycle’s paint job will go a few shades lighter if it’s constantly exposed to the sun. The color change is even more noticeable in colors other than black, grey, silver, and white. You need to wash your bike regularly to remove any grime which can wear out the paint and make it more susceptible to sun damage. Once in a while, you should give it a wax as well to create a protective barrier, just like you would with sunscreen. Don’t overdo the waxing since it can have a negative effect. Try to toss a motorcycle cover over it for extra protection when you’re not using it. The sun and heat can affect your fuel in two ways: it can evaporate, or it can decompose. It’s pretty much the same for all vehicles. When the mercury rises, the fuel expands and evaporates and slowly makes its way out through the fuel lid. You’ll probably find yourself visiting the gas station more often in the summer. On the other hand, fuel decomposition doesn’t specifically happen to the gasoline in the tank, but it does affect the fuel that’s traveling through pipes and hoses on its way to the engine. Gas can get stuck in those pipes when you turn off your bike. The sun can cause the rubber hoses to degrade and release impurities into the fuel, causing it to decompose. It’s not likely to happen to you since the process takes time, but you should still know that it can happen. You should consider mixing in some fuel additives next time you refuel to get more out of your gas. If you already use synthetic oil, you don’t have to worry too much about the sun affecting your oil. Synthetic oils such as the ones you can find at AMSOIL provide constant protection, regardless of the weather. Motorcycle oil performs many tasks within a bike, unlike car oil which has only one main responsibility. As the oil heats up, it can start to break down and lose its viscosity, which means it won’t be able to protect your engine and regulate its temperature. This is especially common with mineral oil. If you’re still using mineral oil, you need to consider getting a synthetic oil change this summer. Browse AMSOIL’s motorcycle line to get everything you need to get a synthetic oil change at home. Try their 15W-60 Synthetic V-Twin Motorcycle Oil and don’t forget to pick up an oil filter too. You can also call Amsoil4liny at (888) 826-7645 to get some recommendations and place your order. Tires are designed to stand pressure and heat, but they do need to be cared for and nurtured from time to time. The heat can cause them to expand and apply extra pressure to the tire walls. When the pressure becomes too much, the tires can crack and burst. Check your tires for cracks and dryness often. Moisturize them with silicone spray to prevent cracking and drying. Rubber, plastic, and pleather tend to get altered under constant sun exposure. They can become hard and brittle as well, and can eventually crack and tear with regular use. Your motorcycle’s kickstand can “melt” or soften with the hot pavement as well, causing your bike to fall over. Use a rock or a makeshift kickstand to keep it upright. Lastly, let’s not forget how horrible a scalding hot seat feels under your bum! You need to store your bike somewhere cool and covered. Protect your motorcycle from the summer heat by providing it with the powerful protection an AMSOIL Synthetic Oil change brings. Call Amsoil4liny at (888) 826-7645 to get everything you need to keep your bike lubricated.